How much does it cost to go on a Mount Everest Base Camp Trek? Home » Blog » How much does it cost to go on a Mount Everest Base Camp Trek? How much does it cost to go on a Mount Everest Base Camp Trek?. It is very difficult to answer you straightly but its very important to remember the following as your price will depend on it. How do you go?. And how many days do you want to trek for?. EBC trek takes 12 -14 days on average. What time of year are you planning to go?. October – November or March – April is a busy season is more expensive. Who do you buy the trek from?. Travel agent?, online group travel?, an online agent?, in-country guide?, local guide?. What type of trek do you want to do?. All inclusive or with a guide only?. Just have in mind that the local trekking agency are expert and arrange your trip perfectly so choose the local trek operator rather than a bigger international trek agency. And selecting your trip with Local trek operator agency, your price is cheaper and you are helping the local economy. Cost of booking a Mount Everest Base Camp Trek online with a private company is probably the best way to make your trip cheaper. Trekking to Everest with the price ranges USD$1,250 all the way to USD$1,800 for an average 12 to 13 days trek. Prices generally includes all permits, Kathmandu – Lukla – Kathmandu round-trip flights. Also includes lodge accommodation, meals, guide, and porters. Prices won’t include guest travel insurance, visa fees, trekking equipment. The benefits of booking online are everything will pre-arrange for your arrival. You can literally arrive in Kathmandu on day one and head out trekking on day two. Some things like trek permits or Lukla flights are not mention and need to clarify in writing. Be aware that it is very important to be aware of “too good to be true prices” online. US$ 900 or even less for the base camp trek with a “well known” agency might well mean you’re joining another much larger group can cause all sorts of problems later on. For an example people not showing up, no choice in accommodation, being with a big group of another nationality you may not like etc. In 2018 it’s also important to be aware of Nepal’s fake helicopter rescue scam which is link with very cheap treks offer online and in Nepal. Moral of the story? is read this blog page carefully and you’ll quickly calculate the cost of an Everest base camp trek base on your own needs. For your clear understanding, we have the breakdown of all costs & budget for a Mount Everest Base Camp Trek. Cost of Flights to Lukla is roughly about US$ 180 per person for one way. Likewise, for the guide is US$ 50 for each way. However, the cost of Everest base camp trek accommodation into the lodges are generally starting US$ 3 to US$ 180 per nights. But they depend upon the quality of lodges that you are choosing the standards. If you just like to choose a clean lodge then it cost US$ 5 per person per night. Furthermore, Hot showers are not included in accommodation prices. So, prepare to pay US$2 for a hot shower. Maybe during the off-peak season, the price of a single room goes little down and it’s easier to bargain a little bit for better prices. There’s also an hourly charging fee for batteries or devices that will set you back about US$2. There’s also WIFI internet charges range from US$ 2 rupees to US$ 5. And even then the service is very slow. It’s best to send a message home to let them know you are okay. Moreover, the cost of meals & water on the Mount Everest Base Camp Trek is Meal prices again vary. Nepali Dal Bhat at the start of a trek can start at US$ 2 and at the high camp go for US$ 9. One liter of bottled water cost in average about US$ 2. Likewise, the cost of Permits for the Everest Base Camp Trek– Sagarmatha National Park cost US$ 32 while a TIMS card costs US$ 20. If you are on ebc trek with an agency then the TIMS cost goes down to US$ 10. However, TIMS cards currently are not compulsory – due to the additional USD$ 20 Solukhumbu fee pay at Lukla. 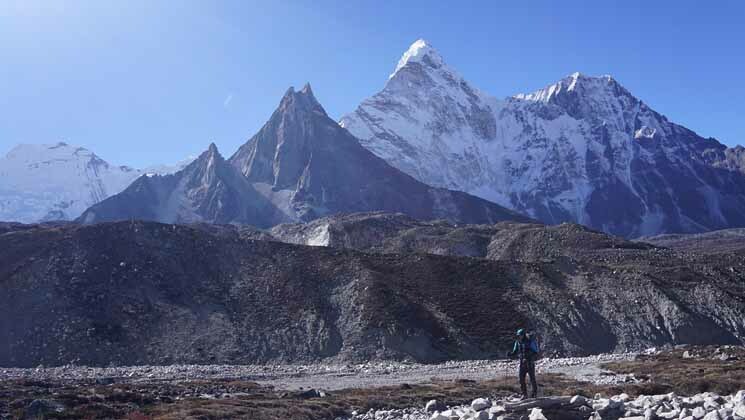 In addition, the cost of guide on the Everest Base Camp Trek is depended upon the high season and low season. Cost of trekking guide hire generally starts from US$ 20 to US$ 30 per day. Generally speaking the higher the cost of your local guide the better they should be. They’ll put safety first, have a good knowledge of the environment and over the decades of experience etc. Thus, these prices only apply to local guides. The cost of a guide-porter or porter-guide on the Everest Base Camp Trek usually cost $20 to 25 per day including their Insurance. If you find all this overwhelming ore difficult, do consider to book your trip with local trek agency. Take a review about ebc trekking in Tripadvisor.